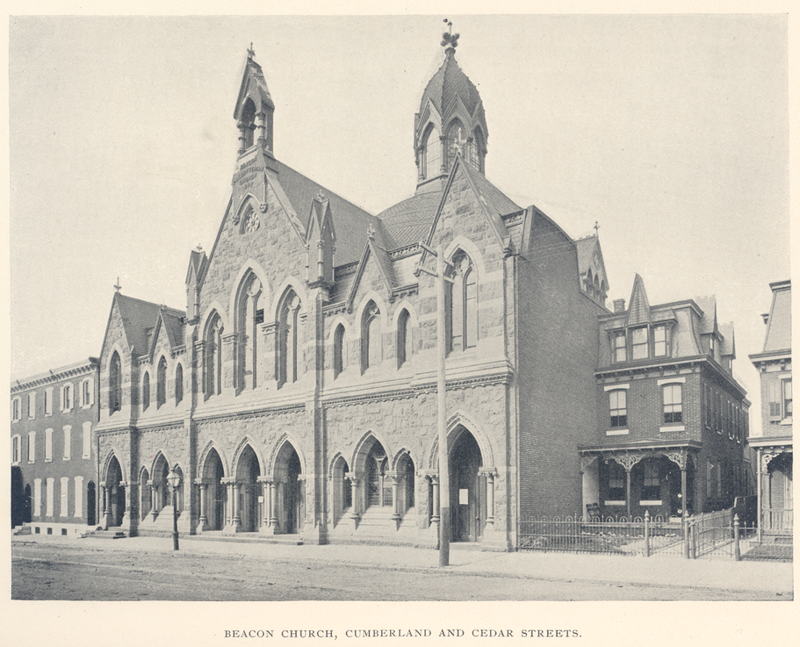 Beacon began life in 1871 as a Sunday school mission of the First Presbyterian Church of Kensington. In 1872, the growing church bought a parcel of land from the Sepviva estate, and constructed a church building at Cedar and Cumberland Streets. The congregation abruptly shrank, holding services in Livezy’s Hall at Frankford and Sergeant, until its dissolution in 1879. 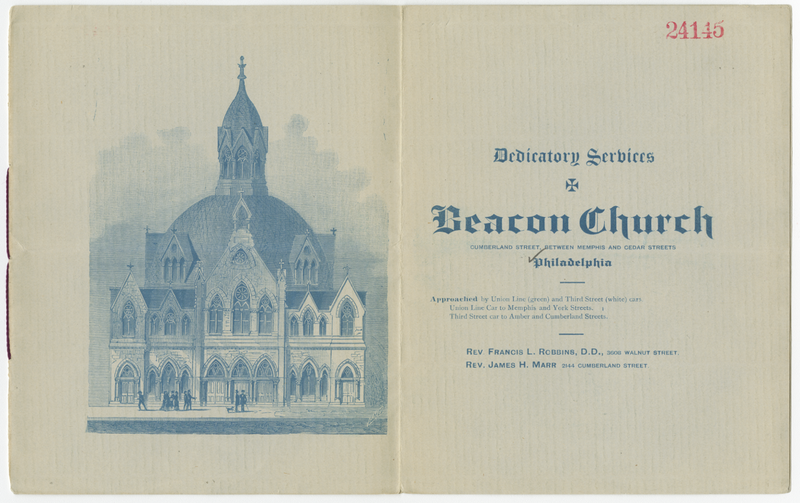 In 1881, the congregation was reorganized by the Presbytery of Philadelphia with 71 members and 448 children in Sunday school, ultimately settling on the name Beacon Presbyterian Church in 1885. Following the rapid expansion of the stylish Kensington neighborhood, the congregation built a new building in 1886 west of the original structure. Beacon’s building was capped by a cupola topping out at 111 feet, visible from Camden. The site included a fellowship hall facing Letterly Street called the Chandler Memorial Building, and a Sunday school known as Disston Hall, where the congregation briefly ran a college. Disston Hall burned in 1920. In 1935, Beacon’s pastor, John Thwing, allied himself with the Independent Board of Commissioners for Foreign Missions, and organized a fundamentalist rival church to Beacon known as Knox Presbyterian Church. The Presbytery of Philadelphia’s administrative commission on Beacon moved to strike Thwing from the roll, not for leading the church into schism, but for “skinning the cat on the strap bar of a trolley car,” for “eating apples in public,” and “other erratic things.” Beacon, though diminished by the Great Depression and schism in the church, survived. Hurricane Hazel in 1955 damaged the main church building beyond repair, and the congregation moved into the fellowship hall, set back from Cumberland Street. The congregation joined the Kensington cluster in 1973, and was dissolved in 2011. New mission work in the neighborhood began in the old church building at the end of 2011, and a new church development known simply as Beacon was organized in 2012, reaching out to the neighborhood through arts and storytelling. Its worship service, known as the Parable, began the next year. One of the PC(USA)’s 1001 New Worshiping Communities, Beacon currently maintains three after-school programs, an open art studio, and weekly worship. As the national archives of the PC(USA), we occasionally have the opportunity to help new church developments preserve documentation of their ministry. Is there an NCD near you that's doing extraordinary work? How do you document it? Give us a call, send us a message, let us know about it! 14 hours 37 min ago. Today’s #HistoricalFigureFriday honors Reverend James Patriot Wilson. Born in 1769 in Lewes, Delaware Wilson went on to graduate from the University of Pennsylvania in 1788. He initially studied law and was admitted to the Bar but the unexpected death of both his wife and brother led him to a religious path. He was ordained as pastor of the Presbyterian Church in Lewes in 1804 and in 1806 he accepted a call to lead the First Presbyterian Church in Philadelphia. He resigned as a much celebrated pastor in the spring of 1830 before he died December 9th 1830. Our portrait of Reverend Wilson was painted in 1807 by none other than James Peale the younger brother of Charles Willson Peale. This oil on canvas painting represents one of the many large portraits James Peale completed after he shifted away from miniatures. To see more works by James Peale visit PAFA The Pennsylvania Academy of the Fine Arts or the Philadelphia Museum of Art.